I’m well overdue for a follow up post to ‘Don’t Kick the Dog’, and the latest media barrage on the untethering of Boston Dynamics’ Wild Cat has got me moving. An unholy hybrid that runs backwards (at least, in biomimetic terms, according to the bend of its ‘knees’), the Wild Cat appears as a larger offspring of Boston Dynamics’ Cheetah, and a kind of faster, if no less noisy*, cousin of Big Dog (now officially christened with the DOD acronym LS3, for Legged Squadron Support System). The occasion for Wild Cat’s celebration via a YouTube disseminated demonstration is its release from the hydraulic line that has previously connected it to an offboard power source, into a parking lot where it can dash around seemingly autonomously, albeit under the watchful eye of its minders. What’s less obvious from this 2 minute demonstration are the enduring problems (or alternatively saving limits) of the power supply, reliant as these devices still are on noisy motors or the short life of batteries. Also relegated to the margins are the projected applications for the Wild Cat, which brings me to Boston Dynamics’ other recent release, the robot Atlas, and the Defense Advanced Research Projects Agency (DARPA) Challenge that accompanies it. As the Boston Globe announces it, university teams selected for the competition are “vying to give [the] brawny robot a brain’ (Bray, August 5, 2013). Delivered to seven universities selected by the DOD for the semi-finals, the web is now awash with ‘unbox’ videos of technicians sporting crisp Boston Dynamics uniforms unpacking the robot into large warehouses specially configured to receive it, as the select students stand around excitedly anticipating the opportunity to develop its applications. Weighing in at 330 lbs. and standing over 6 ft. tall, the device corporealizes the quintessentially threatening humanoid robot. As the Boston Globe observes, “It’s easy to imagine Atlas’s hydraulic arms smashing a flimsy wooden door to reach the humans cowering inside.” But this scene of terror is quickly displaced by the reassurance that “[i]f that ever happens, the humans will probably cheer. Designed by Boston Dynamics, a Waltham company founded by MIT engineers, Atlas is intended to be a first-responder or rescue robot, working in environments too dangerous for humans.” This fantasy rescue scenario will be carried through in the “real-world” test that will end the current qualifying round, scheduled for December of this year, in which the Atlases programmed by the universities will compete for the chance to prepare for a final competition in December 2014. 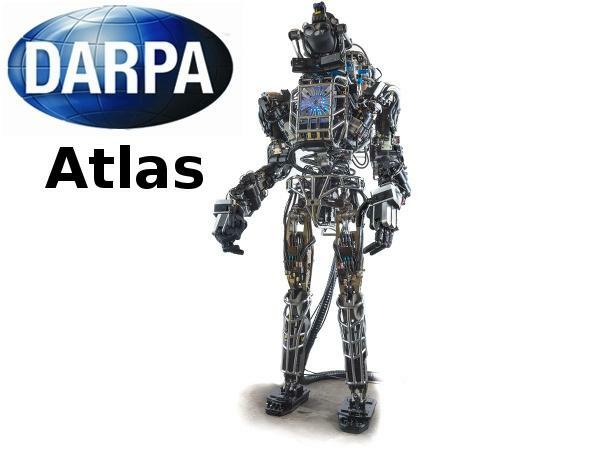 Should we be heartened by the fact that DARPA feels compelled to cloth Atlas’ threatening body in fantasies of rescue? I’m afraid not. On the contrary, to my reading this appropriation of the body of the first responder adds another layer of harm to these projects, resonant with the virtues of the claimed ‘precision’ of the targeted strike. While DARPA challengers and their sponsoring institutions may find a moral high ground on which to stand under the cover of these reassuring scenarios, the robot’s ancestral inheritance from its military-industrial-academic family is too deeply coded into Atlas’ contemporary lifeworld for the claim of its innocent future to be a credible one.